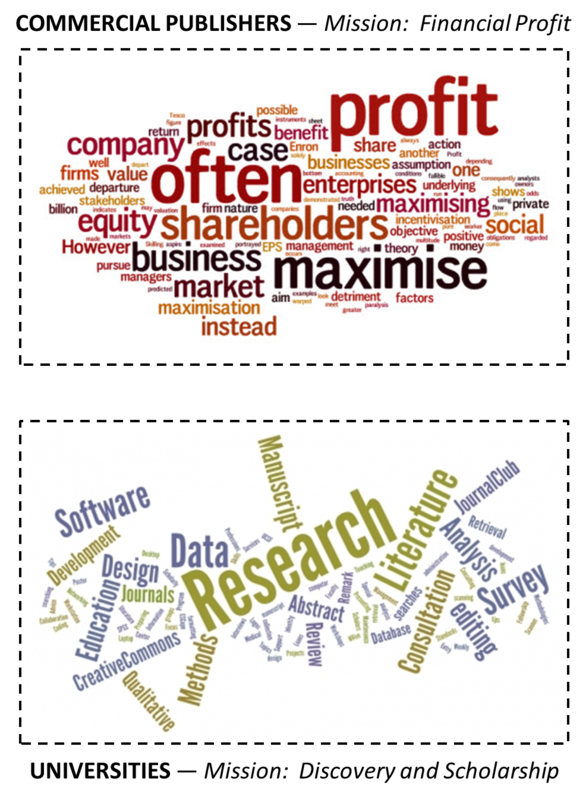 MusingsOne: Why are university researchers still using commercial publishers? Why are university researchers still using commercial publishers? Universities have always been the principal homes and facilitators of scholarly research. Now they are ready to become its publishers. With the virtual replacement of paper publication by electronic (online) journal publication, and the coincident emergence of open access, university libraries, in addition to archiving, are now equipped to administer both peer review service and journal publication for the research community that they support. Even most of the key personnel and expertise — authors, editors, and reviewers — already reside there. They always have. Surprisingly, however, commercial publishers still have almost complete control over the publication of university research. But the wheels are in motion for radical change . Researchers, through a consortium of university libraries, have the power to take over this control with ease — by just deciding to do it. Both stand to reap major cost savings. But even more importantly, a transition to libraries as the principal publishers of university research would open up a badly needed escape route from one of the most crippling limitations on the progress of science and the advance of knowledge: impact factor (IF) elitism. Elitism is nothing but varnished bias, dressed up to look innocent and desirable. But bias is the enemy of science, and stifles the pursuit of knowledge. It is a baffling twist of irony, therefore, that researchers today are born into a ‘publish or perish’ culture where the central mission is for elitism . This is vigorously indoctrinated by many journal publishers and their editors that are more concerned about preservation and elevation of journal impact factor, and competing with other journals for IF status, than they are concerned with dissemination of discovery. 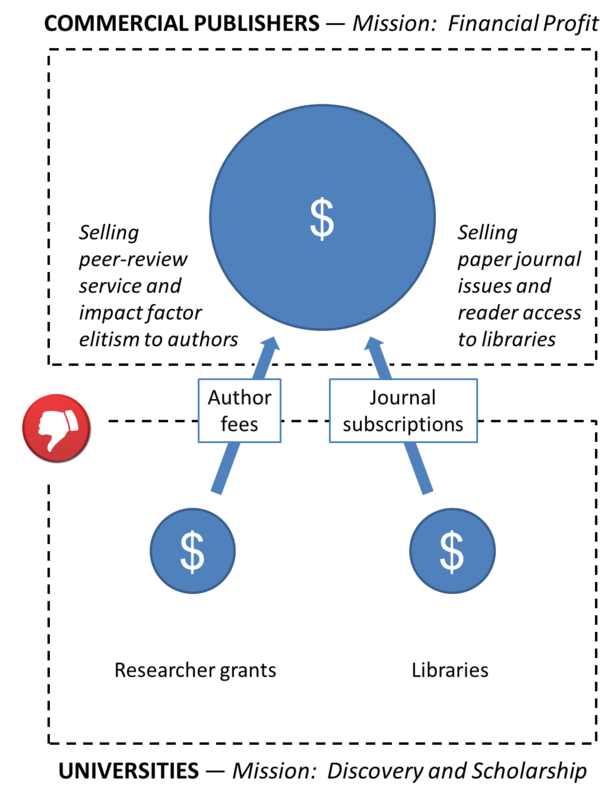 High impact factor generates profit for commercial publishers because there is a market willing to pay dearly for it: authors clamouring to find ways to pay for high article processing fees to open access journals; and libraries gouged by high journal subscription fees for reader access. Many editors routinely instruct their editorial board members to reject good papers and accept only the ‘best of the best’. Often they endeavor to disguise this elitism with claims of limited page space for traditional paper publication (despite that virtually no one reads from paper anymore). Insistence on keeping the space limitations of paper empowers them with a gate-keeping censorship tool for maximizing journal impact factor. Even when libraries cancel paper subscriptions to save money, their electronic (online only) subscription costs usually remain ridiculously high. These unscrupulous rejections by elitist editors delay publication of meritorious research, or leave it unpublished altogether, unavailable to science, lost entirely from the pool of knowledge. Rejection of their good papers also transforms authors into apathetic or petulant reviewers, conditioned to retaliate with nominal effort, or with aggressive, biased reviewing (recommending in turn the rejection of good papers by other authors), thus maintaining excessively stringent peer review filters . Publishers and their editors love this — a self-sustaining mechanism for protecting and inflating IF status, further reinforced by a long-standing tradition of blind and voluntary (free) peer-review. Because reviewer identities are secret, and the contents of their reviews are not public, callous and aggressive reviewers can ‘hide’ behind anonymity. This also enables them to exercise power over colleagues — power to approve manuscripts that support the reviewer’s own research and reject those that conflict with it, or those authored by competitors. This in turn gives editors another tool for rejecting good submissions without ‘looking’ elitist — because they can conveniently ‘pass the buck’ to the anonymous negative reviewer. And because reviewing is voluntary, with no significant reward for good reviewing service, there are no deterrents for bias, no accountability, and hence no quality control. Young academics are now routinely lured into a culture of chasing IF as a metric of merit. Despite its poor record for measuring this , ‘impact factor mania’  persists, essentially because (as yet) no other alternative measures are widely perceived as equally effective for bolstering academic reputation / status. In many cases, this addiction leads to exasperation and burn-out, thus breeding susceptibility to academic misconduct. And when exposed, this results in lost public confidence in the integrity of academic research and the value of funding it. Madly chasing impact factor leaves not just authors fatigued, but also their reviewers — who are also authors, and hence already fatigued from also chasing impact factor. Total reviewing time load is multiplied when the same paper is submitted to several journals, as disillusioned authors frantically ratchet down the impact factor ladder, wasting time and resources reformatting and re-submitting papers for different journals (the ‘tragedy of the reviewer commons’). Everyone is desperately overworked. With no incentives, willing reviewers have become harder and harder to find; they are fed up with providing free service for journals while their publishers collect exorbitant profits from library subscriptions and author fees. With never enough hours in the day, requests to review are declined more and more frequently by more and more potential reviewers — thus leaving the real tragedy: few papers ever get reviewed by the most talented and best qualified reviewers. Traditional elitist journals are unlikely to take the lead in efforts to correct the above problems. It is in their best interests (for corporate profit generation) to keep the current system in place and to instill complacency about limitations, false pride in the ‘traditional way’, and false confidence in the view that, although not perfect, the current system is the ‘best we can do’. But it’s not. 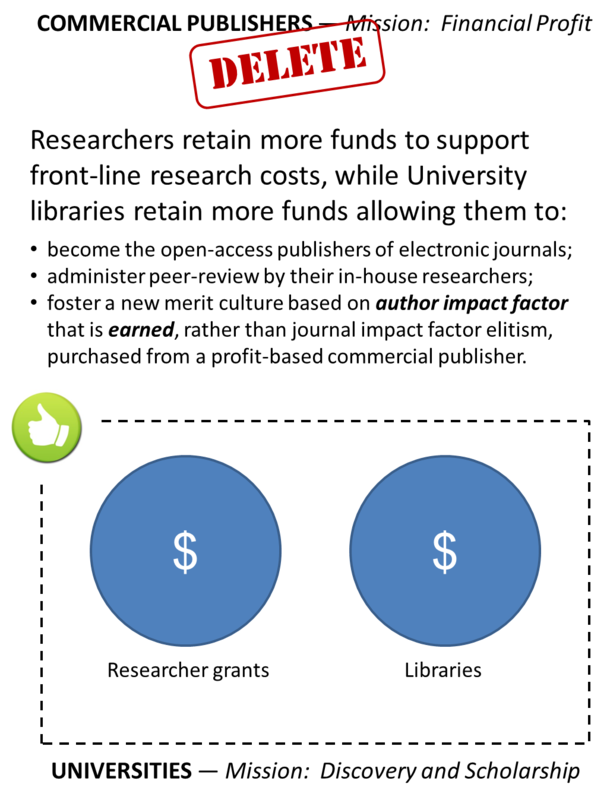 The technology for electronic/digital publication — that first allowed us to abandon paper and thus pursue the benefits of open access — has now combined with modern, easily accessible online platforms (for everything from manuscript submission and reviewer management, to editing tools, website hosting, and pdf article production) to provide the means for dispensing with profit-based commercial publishers altogether. This movement is now starting to gain significant momentum  , and several institutional libraries , including my own at Queen’s University, already host publication of a growing selection of peer-reviewed journals. Researchers can now easily organize themselves, under an administrative consortium of their institutional libraries, to publish their peer-reviewed, open-access work digitally (online), with author fees kept down to cost-recovery level only — thus leaving more money to support the front-line operating costs of research — and guided by a mission for discovery, rather than a mission for impact factor elitism. With freedom from the heavy cost burden of library subscription fees to profit-driven publishers, university library budgets will be more than equipped to fund their transformation in becoming the principal non-profit publishers of science and other disciplines, and repositories for digital data and other research products. The reputations of universities for accountability and commitment to the pursuit of knowledge will also provide branding that can match or exceed the integrity of the biggest multi-national publishers. And most importantly, in my view, this new domain for peer-review publication clears the way to break free from the malignant addiction to chasing IF. Not all researchers will be anxious to walk away from elitism; addiction can have a powerful hold. But for the brave and forward-thinking, this new opportunity will motivate and enable researchers to experiment broadly with different models [e.g. 10] for identifying and using peer-review filters that are optimal for the progress of science and discovery, and to foster a new merit culture based on ‘author impact factor’ that is earned, rather than journal impact factor elitism, purchased from a profit-hungry commercial publisher. Aarssen LW, Lortie CJ (2009) Ending elitism in peer-review publication. Ideas in Ecology and Evolution 2: 18-20. Aarssen LW (2012) Are peer-review filters optimal for the progress of science in ecology and evolution. Ideas in Ecology and Evolution 5: 9-12. CasadevallaA, Fang FC (2014) Causes for the persistence of impact factor mania. mBio 5(2):e00064-14. doi:10.1128/mBio.00064-14. Wright JM (2014) Open Access and the Public Purse. Academic Matters July 28, 2014. Aarssen, L.W. & Lortie, C.J. 2012. Science Open Reviewed: An online community connecting authors with reviewers for journals. Ideas in Ecology and Evolution 5: 78-83. Why not follow the physics ArXiv model and slowly move away from the journal model altogether? What is the use of journals if the status of your paper is not anymore derived from it and if journals have lost the community function? In an intermediate phase we might work with megajournals covering broad fields (e.g. PLoS or, better, PeerJ. The problem with any sort of impact factor is that one can game it. Author impact factor would simply result in the corrupt generating large cross citation networks (as already seen with some journals and indeed with some researchers). There is nothing quite like reading a paper - the best advice to anyone on a hiring panel is to actually go and read some of the applicants' paper and ask questions. The problem is addiction. We all agree, but we have a mantra repeated loudly from on high "4*", "IF>10", etc. My suggestion is that we vote with our wallets. Time is the most precious commodity, so simply refuse to review for the commercial sector. it is a simple step, and does not need any form of institutional decision and shifts us away from the fatal addition to IF. There is a 'tipping" point (where I do not know) when the commercial sector will start to be undermined to an extent that the mantras will cease. Then we will see institutional action. Lonnie Aarssen . Simple theme. Powered by Blogger.